AxiDraw machines work with a variety of writing instruments, including permanent markers and fountain pens. 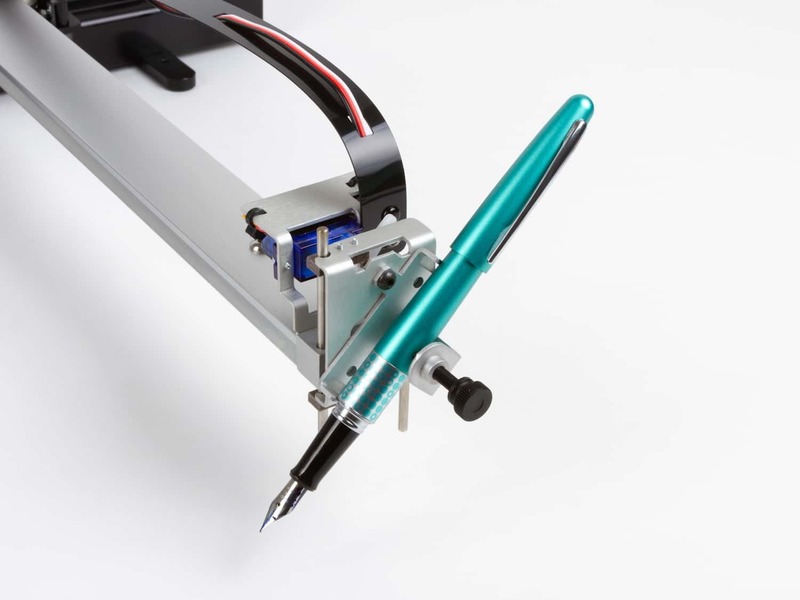 The unique writing head extends beyond the base of the machine, making it possible to write or draw on almost any flat surface. The AxiDraw is a pen plotter, which is a type of simple robot. Its sole function is to guide a pen (or other implement mounted in the pen holder) along the set of vector lines, curves, and paths that you ask it to follow. Everything that the machine is ultimately capable of, such as drawing graphics, writing text, or signing documents, are expressions of this basic function. It is capable of drawing essentially anything that can be composed from a set of lines. In practice, this is much like using a traditional printer, except that you need to take care that your documents are made of of paths, rather than pixels. The AxiDraw is an extremely versatile machine, designed to serve a wide variety of everyday and specialized drawing and writing needs. You can use it for almost almost any task that might normally be carried out with a handheld pen. What kinds of pens can you use? AxiDraw does not require proprietary pens or ink: you can use your own pens, chosen within certain guidelines. Good choices for pens to use include fountain pens, permanent markers, liquid-ink rollerball pens, technical pens, small-bodied whiteboard markers and other writing and drawing instruments that do not require significant downward pressure. While we refer to writing and drawing instruments as “pens” to be concise, other instruments such as automatic pencils (particularly with soft lead), chalk, charcoal, and brushes can also work well in many cases. You can read more about pen choices in our documentation here. What kinds and sizes of paper can you use? The XY travel (printable area) of the AxiDraw V3 is just over that of both US letter (8&half; × 11”) and A4 paper sizes. The larger size models have about twice this travel. You can work with any size of paper up to the size of the travel area. You can write directly onto small pieces like business cards (or a whole array of them), medium size pieces envelopes and note cards, or sheets of paper. You can also work with paper larger than the travel area. The unique design of the AxiDraw features a drawing head that extends beyond the body of the machine, making it possible to also draw on flat objects bigger than the machine itself. For example, you can set it right on top of a box to write an address. You can even set it on top of a poster board, chalkboard, or whiteboard to draw graphics in place. For most applications, the standard-size AxiDraw V3 is the best choice. It's compact so that it fits on your desk more easily, and has enough plotting area to cover any size up to 8&half; × 11” / A4. The larger AxiDraw V3/A3 has twice the plotting area and is perfect for people who need to plot larger items, or to fit two smaller items — like two US Letter or A4 pages side by side, or a sheet of paper plus an envelope. The Special Edition AxiDraw SE/A3 has the same plotting area as the V3/A3, but features a heavy, rigid base CNC machined from a solid block of Aluminum. It's our top-of-the-line machine, and includes a few nice accessories as well. Available AxiDraw accessories include alternate pen holders, a tripod mount, a rigid mount that can be used instead of the pen slide, extended feet, extra clip easels, and magnetic workholding easels. You can find them listed here at Evil Mad Scientist. AxiDraw requires a reasonably modern computer (Mac, Windows, or Linux) with an available USB port and internet access to download software. Linux requirements: Recent versions of Ubuntu and similar widely-supported distributions work well. If you are using an obscure or "challenging" distribution, we'll still do our best to help you out. Nope. AxiDraw machines come complete, assembled, tested, and ready to use. If you get a head start by reading the user guide and installing the software, you can be up and plotting five minutes after opening the box. Internet access is required only for downloading software and for access to online documentation. Internet access is not required while preparing files or using AxiDraw. What type of power supply is included? A universal-input plug-in power supply is included with the AxiDraw. It accepts worldwide 100 V - 240 V input, and has a US/Canada style plug. For other regions, an inexpensive plug shape adapter will be needed. No. Most users just make a file or drawing and plot it. You do not need to purchase any additional software to use AxiDraw. Can I download the manual? Yes, and we highly encourage you to do so. Reading the manual is a great way to determine if AxiDraw is a good fit for you. The AxiDraw V3 family user guide is available for download here (10 MB PDF). How long does plotting take? Unlike a (raster-based) inkjet or laser printer, the time that it takes a plotter to print a page is not fixed. Rather, it depends on the length of distance that the pen has to travel. The AxiDraw typically moves at about the speed of a human hand, depending on your settings, and the plotting time varies accordingly. This question is much like asking how long a human takes to write or draw on a piece of paper: Addressing an envelope might typically take a minute or two, but complex artwork can potentially be a matter of hours. Such is the case as well for AxiDraw. Yes. The speed of the AxiDraw is adjustable, depending on your tradeoff between faster completion and higher precision. AxiDraw can move quite quickly (faster than a human normally can) when making large strokes with a wide-tipped marker, but even a (human) calligrapher will slow down for higher neatness. The wedding invitation text in our video should give you a decent idea of typical writing speed when going for higher neatness; that example is a little slower than people normally write. Can I input my signature? Yes! The best way to do that is by directly capturing your signature as you sign it, for example on a phone or tablet screen. That way, the AxiDraw can replay it just in the same way that you wrote it. Capturing a signature is covered in our documentation on handwriting, here. Can it replicate my handwriting? Yes, but it requires an added step of creating a custom font. We are now working with a company that can create a unique font in your own handwriting (at added cost), in a special format that is designed to plot well on the AxiDraw. We also have some special utilities, available to AxiDraw owners, that can add handwriting-like "defects" to your text. Text laid out in perfectly even rows (like what you get with a handwriting font in MS word) always looks a little too "robotic" to be handwriting. Can you replicate handwriting from scans? No, not in the way that you might hope. 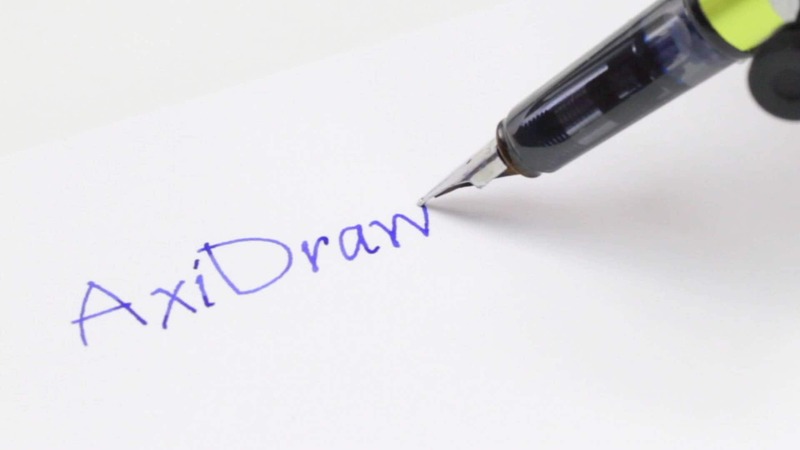 However, and with only rare exceptions, automatic tracing of scanned handwriting creates a somewhat unpleasant imitation of handwriting, and we do not recommend this approach as part of any workflow. You can read more about tracing scans in our documentation, here. Is a paper feeder available? Not at present, but it is something that we are looking into. Some AxiDraw users do use various types of paper handling machines — sometimes printers with built-in paper feeders and sometimes commercial solutions. Professional print shops and companies that make equipment for them have many different ways of moving pieces of paper from point A to point B. More commonly, for small scale use, AxiDraw users manually swap out paper clipped to small clipboard easels or use larger-size AxiDraw units that allow multiple pages to fit within the print area. What else is AxiDraw used for? Can I use it to write on fabric? Yes; you can see a few examples here. The key issues that you need to be aware of is that the fabric generally needs to be held taut, and you need to choose markers that don't easily catch on the fabric. It is likely that with care and experimentation you will be able to make it work. Can AxiDraw be used for calligraphy? Calligraphy is not the same in any sense as (for example) simply using computer fonts or plotting a drawing. Calligraphy generally involves individually sculpted letter shapes, and in many cases pen movements that are far more complex than AxiDraw can provide. That said, some calligraphers do use AxiDraw for low-end busywork (say, addressing hundreds of place cards), saving some wear on their wrists and presumably passing along some of the cost savings. Can you use it for cutting? 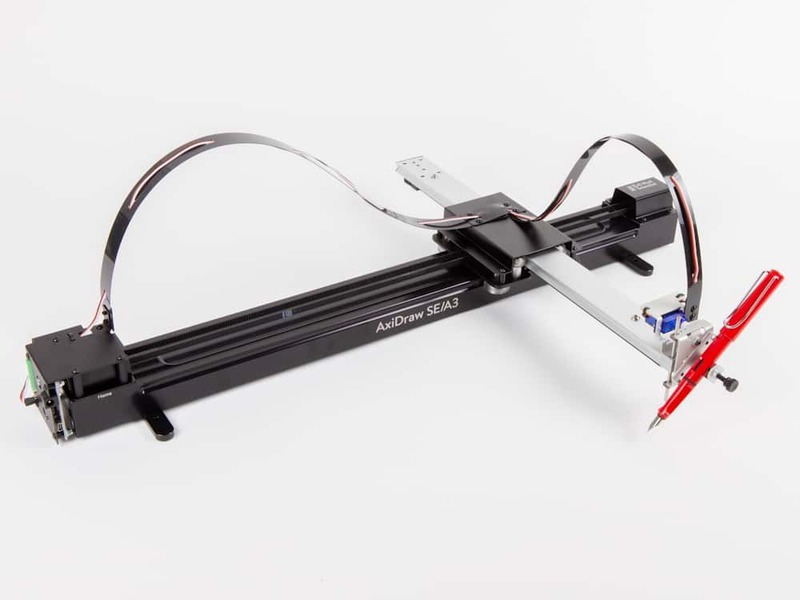 The AxiDraw is designed for moving a pen, not a carving or cutting tool. It does not have the type of rigidity that you need for carving, nor the ability to apply significant downward force. That said, a number of people have experimented with it. Here is one notable project, using the AxiDraw for cutting cardstock and vinyl. Does it work with international fonts? AxiDraw can be used with whatever fonts are on your computer, so long as the text is converted to paths before plotting. Is there support for mail merge? We are currently developing a new software application called AxiDraw Merge, which is a mail merge type solution for AxiDraw. It can automatically populate a template with data sourced from a CSV file, prior to rendering the text into handwriting-like fonts, with certain limitations. AxiDraw Merge is in beta testing and available to AxiDraw owners. Can you mount it to a wall? The AxiDraw is designed to work on flat surfaces, and we do not test them in the vertical orientation. That said, quite a few AxiDraw users have mounted theirs to the wall without apparent difficulty. One issue to consider is that the AxiDraw's pen holder normally rests the pen on the writing surface by its weight alone. On the wall, you'll need an alternative to gravity for lowering the pen. The typical solution is a rubber band. (1) We maintain a large and growing library at the AxiDraw Wiki Page, our central documentation site for all things AxiDraw. (2) We have support forums for the AxiDraw, here. (3) Most importantly: We're the designers and manufacturers of the AxiDraw, and we're here to help! Please don't hesitate to contact us directly. How long can the AxiDraw run for? AxiDraw does not have a duty cycle limit. You can run it all day long if you like. What parts can wear out? 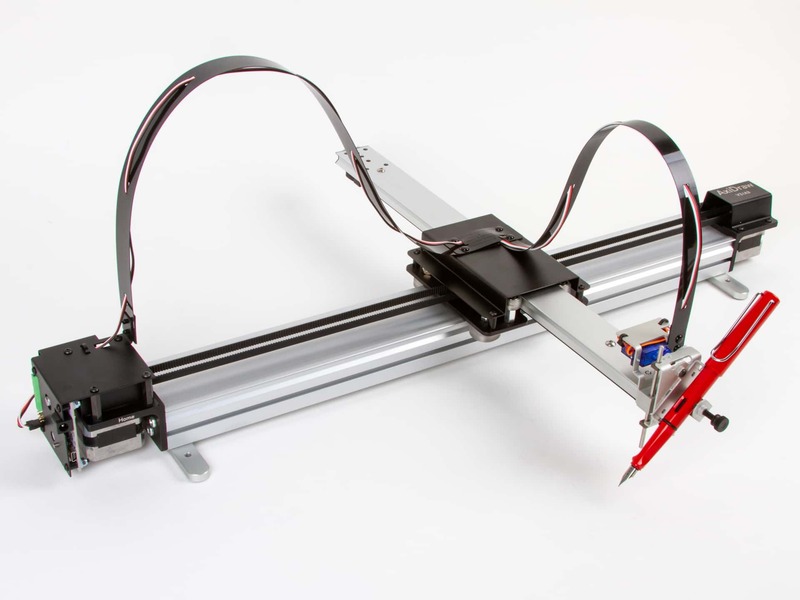 The AxiDraw is designed to be serviceable for a long life. Components such as the drive belt, rolling wheels, ball bearings, and stepper motors can all be replaced in the unlikely event that it should become necessary. One component on the AxiDraw is considered expendable and may need regular replacement in heavy duty (e.g., industrial) settings. The small pen-lift servo motor does wear out over time but is inexpensive ($8) and straightforward to replace. For heavy duty applications, you may wish to keep a spare on hand. No. While AxiDraw is most commonly controlled through a set of extensions to Inkscape, there are other methods of plotting including the command-line interface (CLI). Many AxiDraw users do their design work in other programs, and use Inkscape as their "page setup" screen for plotting. What programming interfaces are available? This interface plots SVG files just like the GUI-based software, but is suitable for either direct use or automation using shell scripts. Two APIs for python. One is equivalent to the CLI software in that it plots SVG files. The second is an "interactive" style API, supporting moveto/lineto type commands. Low-level control is available through the EBB command set. It can be used in any environment that supports USB serial communication. A simplified API within cncserver, which uses only GET commands, and supports turtle graphics type commands. Suitable for use within Scratch and other environments that can retrieve URLs. For real-time plotting in response to user input and for certain other generative applications, you can plot directly within Processing. Where are AxiDraw machines manufactured? AxiDraw machines are designed, assembled, and tested right at our facility in Sunnyvale, California. Demos are available by appointment at our shop in Sunnyvale, CA. Please contact us to request an appointment. We're open M-F, 12-6, and closed on US postal holidays. How does the AxiDraw work, mechanically? The AxiDraw has two precision stepper motors in its base. Together, they drive a single looped belt that moves the carriage around in the XY plane. The high-performance linear stages feature custom-designed wheels that roll smoothly on custom aluminum extrusions, specially designed for high stiffness and light weight. 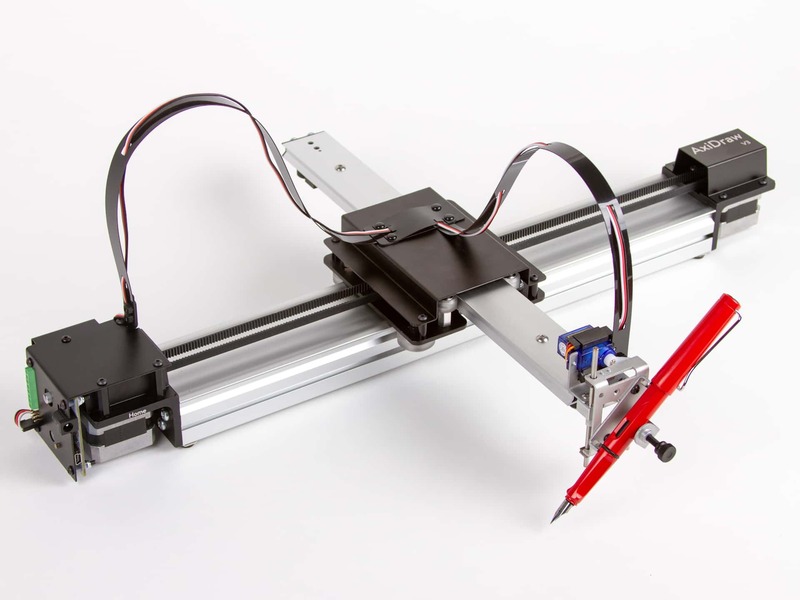 The pen-lift stage uses a separate mechanism: a smaller third motor, combined with a precise low-friction linear stage, serves to lift the pen off of the page. In addition to the AxiDraw models listed above we do have one other standard size. The AxiDraw V3 XLX has a plotting area that is extended in the long (X) direction only, such that it fits two US letter or A4 size pages end to end. We also make larger format AxiDraw machines to order, including an Axidraw V3/A2 (with plot area of 597 × 432 mm, or 23.5 × 17 inches) and an Axidraw V3/A1 (with plot area of 897 × 600 mm, or 35.3 × 23.6 inches). These larger machines typically require a custom shipping quote, so please contact us if you are interested in one. Do you offer robo-writing as a service? No; we do not offer any printing services. My question isn't on this list! Please contact us and ask; we're here to help. Our AxiDraw documentation wiki is a continually growing library of resources for getting started with the AxiDraw, including a thoroughly detailed user guide, support forum, a number of tutorials on specialty topics, and links to additional resources. Personal support: We're here to help! Having an issue? Need to know where to find something in the manual, or how to do something that isn't in the manual? Want to ask us about your application before deciding to purchase? If so, please don't hesitate to contact us directly. Our goal is to provide personal, competent service both as you get set up and running, and for as long as you have your AxiDraw. 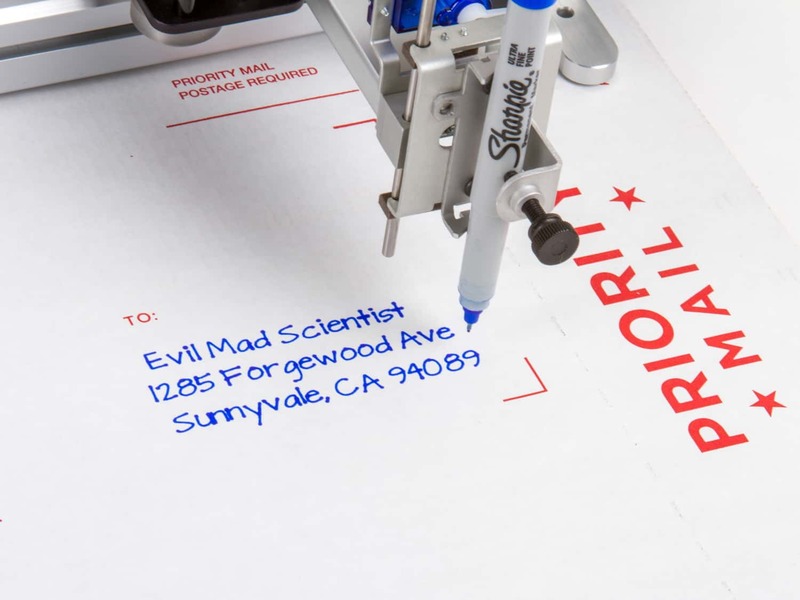 AxiDraw machines are designed and manufactured by Evil Mad Scientist in Sunnyvale, California. A project in collaboration with Lindsay Wilson of IJ Instruments Ltd.